One of the most common foot problems for all ages is the ingrown toenail. 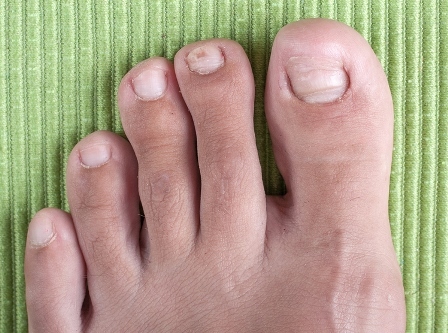 This condition can occur when the edges of your toenail grow into the skin on the toe due to excessive trimming, overly tight shoes, heredity, toe injury or other toe conditions such as fungal infections. Any toes can be affected, but the big toes more likely than others. As the nail grows under the skin, the area becomes irritated, red, swollen and hot. Having broken skin around the nail can open you up for bacterial infections, resulting in pain and drainage. The skin may even grow over the ingrown nail. Once your podiatrist examines the toes and diagnoses an ingrown toenail, he may suggest soaking your feet in warm water. The embedded nail may be lifted clear of the overgrown skin and packed with cotton. Oral antibiotics may be prescribed for infection, and nail surgery might be indicated. Some treatments can be done at home, such as soaking feet in warm soapy water or Epsom salts. The American College of Foot and Ankle Surgeons however, discourages home treatment if an infection is suspected, or if you have high-risk medical conditions such as diabetes, nerve damage in the foot, or poor circulation. Patients should never try to perform “bathroom surgery” on ingrown toenails. Rather than risk complicating this painful foot condition, see your podiatrist as soon as possible. Foot and ankle surgeons offer a simple treatment that involves a minor surgical procedure that can be performed in the office. To relieve pain, your doctor removes the ingrown nail and possibly part of the bordering tissue using a local anesthetic. Severe ingrown nail problems may indicate a need to remove the nail root. Following the procedure, most patients feel little pain and may resume normal activities the next day. Consult with Dr. Legel to understand his recommendations and expectations for your individual case. To schedule an appointment with our foot surgeon to examine your ingrown toenails, please contact our office at (214) 366-4600. You can also use our convenient contact form located at the top of this page.